It is not often that I collaborate with another photographer when shooting an advertising campaign. And it's certainly never occurred when the other photographer and I are located on separate continents, we have never met, nor have we ever spoken. But this was the case with Johnnie Walker's 'Join The Pact' campaign that I created together (yet separately) with British photographer Leo Cackett in China and the UK respectively. As part of Johnnie Walker's sponsorship of the Vodafone McLaren Mercedes Formula One Team, global creative innovation agency Iris Worldwide is tasked with developing the brand's 'Join The Pact' campaign. 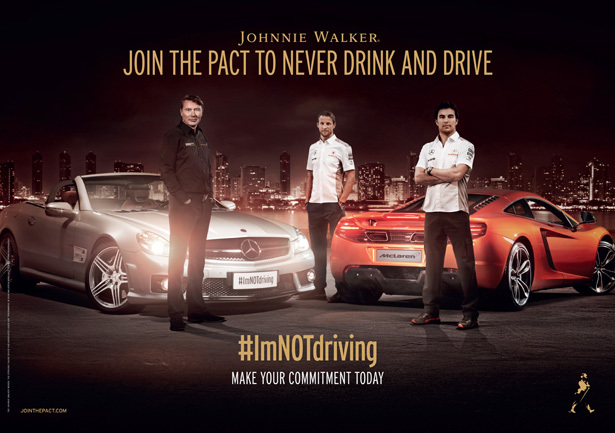 This social responsibility initiative encourages consumers worldwide to join McLaren F1 drivers Jenson Button and Sergio Perez, along with Johnnie Walker’s Responsible Drinking Ambassador and two-time Formula One World Champion, Mika Häkkinen, in signing a pact to never drink and drive. leave space for them in the frame and light the set accordingly, making the shoot all the more challenging. It was among the largest outdoor sets that I have ever worked on, taking my crew and me more than eight hours to set up and prepare ahead of Häkkinen's arrival that evening. Because he had other sponsorship obligations immediately following our shoot -- he had to film the final scene of Button's 'Ultimate Walk' advertisement with Firecracker Films elsewhere in Shanghai -- I was permitted just twenty minutes to photograph Häkkinen. A few weeks after I photographed Häkkinen and the cars in Shanghai, Leo shot Button and Perez at McLaren's factory in Woking, England. The driving duo were then composited into the template my team and I created in China to complete the final 'Join The Pact' advertisement. The 'Join The Pact' campaign launched globally this week. And last night, Häkkinen and Perez were at Clarke Quay in Singapore for the official media event, which I documented for Johnnie Walker's social media channels. It was a pleasure to work with Mika Häkkinen, as well as collaborate with Leo, Iris and Firecracker, all of whom worked tirelessly to make this shoot a success. Browse more of my advertising photography portfolio here.